Bridge St. Chocolates, Charmed Spirits, Lush Consignment Boutique, Best Friends, Lulu's, Country Charm, LEO wedding decor, K&M trends, Jewelry by Megan and many more of your favorite local stores and vendors will be at Ladies Night Out! 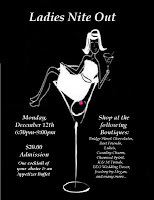 Ladies Night Out is hosted by the Columbia Bar and Grille on Monday, December 12th from 6:30 to 9p.m. With a $20 admission fee, you will receive a cocktail of your choice, an appetizer buffet, and a chance to shop at all the wonderful stores under one roof. 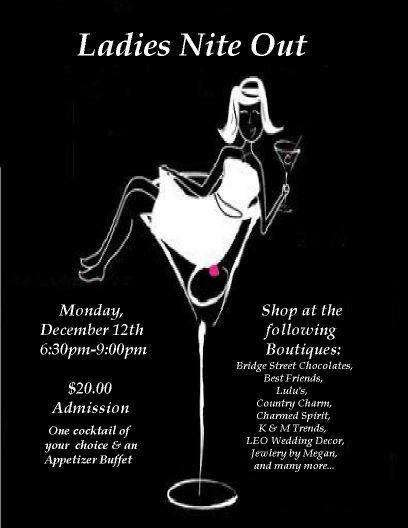 So come on by with your girlfriends! This will be a fun filled evening!